Trees serve both practical and aesthetic functions, and people can become quite attached to them. But work to maintain, trim, and even remove trees should be left to the professionals, who say their profession is often dangerous, but in all ways rewarding. Joseph Alexopoulos has given many customers quotes for taking down a tree. But he will never forget the day he arrived at a house, saw a rope hanging from the tree the homeowner wanted removed, and asked about it. “I was told the man they hired before me died trying to fell it,” said the president of Tree 413 in Longmeadow, adding that the tragedy is an example of how dangerous the work can be. Local experts agree it’s critically important to hire professionals with the knowledge, training, proper equipment, and insurance to prevent homeowners from being sued if an accident occurs on their property. The Tree Care Industry Assoc. says successfully felling a tree requires knowledge of tree physics, biology, dangerous tools, and advanced cutting techniques, and homeowners who attempt their own tree removal may be injured by falling limbs, malfunctioning equipment, or the tree itself. The work is hazardous by nature, and professionals are completely outfitted in protective gear and trained to climb trees, operate cranes, and use chainsaws, ropes, wood chippers, and stump grinders safely. 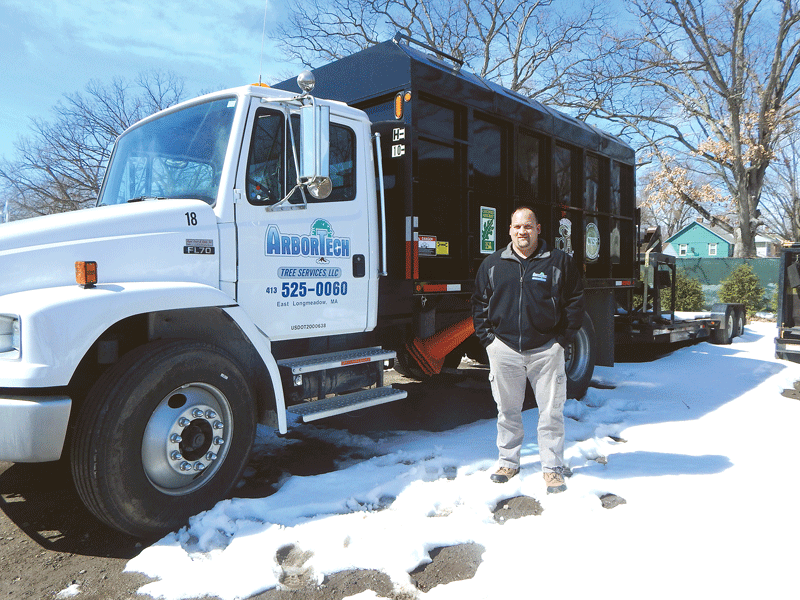 Manager Randy Sample of Arbortech Tree Service LLC in Springfield says the company holds weekly meetings led by employees to discuss situations they encounter and the safest way to deal with them. “Unforeseen scenarios can occur, but we go to great lengths to eliminate the possibility of accidents,” he said, adding that employees use a wide range of equipment, adhere to OSHA standards, and are certified annually in electrical hazard and prevention, which ensures they are familiar with equipment utility companies use to provide electricity and the dangers associated with tree care and utility lines. Tree pruning and felling is a major source of income for most local tree-service companies, but many have branched out, and the scope of their work includes a wide variety of jobs. Arbortech created a Plant Healthcare Division five years ago to keep trees healthy, because problems almost always begin in the root system. Randy Sample says Arbortech employees meet weekly to discuss potentially dangerous situations and how to handle them. “By the time they are noticeable, it may be too late to save the tree,” Sample said, adding that he has heard countless stories from families about their emotional attachment to a particular tree, and, therefore, the company strives to prevent damage that can threaten the health of these woody plants. Tree 413, meanwhile, specializes in difficult tree removal that typically requires cranes, special equipment, and skilled climbers. “Many trees literally need to be lifted over the house with a crane as a whole or in pieces; it’s not a job where you can cut corners,” said Alexopoulos, adding that the company’s business has doubled every year for the last three years and workers do everything possible to ensure that limbs don’t fall on a roof, power line, vehicle, or anywhere else that could cause damage. 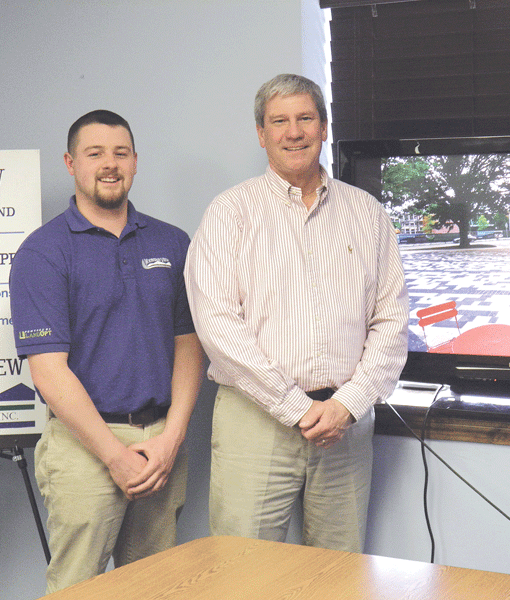 The company also does excavation and demolition, plans to start selling colored mulch, and recently opened a store in Southwick that carries equipment for professionals and homeowners that can be rented or purchased. It ranges from heavy-duty machinery to chainsaws and leaf blowers and includes clothing appropriate for tree work, because professionals are outfitted from head to toe to ensure safety. Northern Tree Service Inc. in Palmer does a wide range of residential, industrial, and commercial work in three divisions that include tree service, land clearing, and construction. Its work ranges from felling trees to identifying potential hazards such as overhanging branches, dead limbs, or diseased trees for municipalities, golf courses, and other venues, as well as providing access for utilities. For this issue and its focus on landscape design, BusinessWest looks at the scope of work that tree service companies do and the reasons they are called upon for help. Local tree-service companies say homeowners should never hire anyone without asking for proof they have liability and workers’ compensation insurance. Nick Powers says Northern identifies problems like weak limbs for its clients before they cause damage or injury. “Many small contractors let their insurance lapse, so even if the person hands you a copy of a policy, you should call the phone number on it to ensure they are paid up to date,” Alexopoulos told BusinessWest. Sample concurred. “People need to do their homework; the level of danger is very real, and there are many companies that are not qualified to do this type of work,” he said, adding that homeowners should also ask for referrals, make sure the company adheres to industry standards, and check if its arborists are certified through websites such as www.treesaregood.com, which offer educational materials and links to helpful information. In addition to tree trimming and removal, Tree 413 performs excavation and demolition ranging from removing a sidewalk to an entire garage and foundation, or a Gunite pool made entirely of concrete. When the demolition is complete, workers fill in the cavity, spread topsoil over it, then seed it. The company recently took down three trees for a homeowner in a project that was similar to a major demolition project, because they weighed a total of 60,000 pounds. “The job was very involved and required skilled tree climbers, a crane, and a police officer in the road near our groundsmen who were cutting and chipping sections and putting logs in a truck to be taken away,” Alexopoulos said. He added that dead trees are very difficult to take down, and the job often has to be done in sections. “If a cut branch slams into a dead tree, it can shatter,” he explained, noting that a small limb can weigh 600 pounds. Arbortech also does a large amount of residential work, but its slogan is “more than just tree removal.” The company employs certified arborists who evaluate trees, shrubs, and woody plants and diagnose and treat disease, insect problems, and the type and amount of fertilizer needed for optimal growth. “We try to care for trees from the roots up; we focus on tree preservation rather than removal,” Sample said, adding that indications that a tree is in trouble include problems such as leaves that fall too early. He told BusinessWest that most problems stem from improper planting. Trees can be too close to a driveway, home, or power line, and choosing the right location for a specific species and its future growth is critical. “The root system is the foundation of a tree and is typically as large as its crown or the drip line from the farthest branch,” Sample said. The company’s arborists uncover roots, which are usually buried a foot or two beneath the ground, take soil samples, and inspect the root collar to make sure roots aren’t choking each other, which can affect the nutrients the tree is able to absorb. Arbortech also plants trees and maintains orchards for customers that include apple, pear, and peach trees, as well as raspberry and blueberry bushes. In addition, it sells mulch, loam, topsoil, and both green and 100% seasoned firewood. “It can be a frustrating endeavor to buy firewood that is dirty, not properly seasoned, and doesn’t give the heat people are looking for,” Sample said, noting that the company purchases wood from logging contractors that has been specially cut to fit their machines, tests it with a moisture meter, rotates it so it will dry properly, then puts it through another screening process after it is purchased to ensure the delivered product doesn’t include any loose bark or chunks of wood. Northern Tree Services performs jobs in many settings. It builds roads and work pads for utility companies, and has cleared sections of land that range from a half-acre to 550 acres to make way for power lines, solar fields, gas and oil pipelines — including the Keystone Pipeline — and large commercial contractors. The company has 220 employees across the U.S., but the majority of its work is done in New England, and it also has contracts with colleges, golf courses, apartment and condominium complexes, 40 airports, the cities of Springfield and Boston, the Massachusetts Bay Transportation Authority, the state Department of Transportation, and Eversource. It has also developed a Google Earth program to identify trees that need to be pruned, thinned, or felled. “It’s our job to identify hazards before they happen,” said company spokesman Nick Powers, noting that Northern also has a contract with the state Department of Conservation and Recreation, which is responsible for monitoring and maintaining vegetation on its roads, including the well-traveled Storrow Drive in Boston. The company also does residential and commercial plantings and tree removal and pruning, which is especially important for utility companies because falling limbs can cause power outages. Kevin Ferguson, project manager and estimator, told BusinessWest that arborists identify weak limbs that need to be supported or removed so they don’t fall during a windstorm or from the weight of snow. “It doesn’t take much wind to knock deadwood out of a tree,” he said, explaining that, when they are called to a home, they examine the entire property and point out potential dangers. Some trees can be thinned to eliminate shade and the growth of moss on a roof, while helping prevent gutters from getting clogged with leaves, while others need low-hanging or dead limbs removed. Local tree companies do everything in their power to prevent accidents, but tree work is a risky business and can lead to damage or injury when unqualified people are hired to do a job. It all comes down to respecting the power of nature and checking a company’s credentials, but anyone who hires licensed professionals to plant, prune, or fell trees can rest assured that every possible safety precaution will be taken, and their trees will add beauty and life to their property and be enjoyed by generations to come. James Wawrzyk says the mulch business soars in the spring, and the colder months are spent preparing for the inevitable surge. James Wawrzyk is a successful entrepreneur twice over, after starting his second business specifically to meet a need in his first. 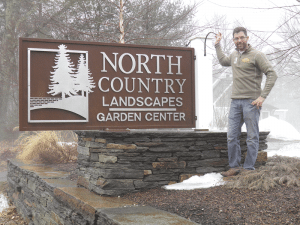 That initial company was Growing Concern, a Wilbraham-based landscaping firm he launched in 1981, offering a wide range of outdoor services, from lawn installation to irrigation; from fertilizing to tree and shrub maintenance. 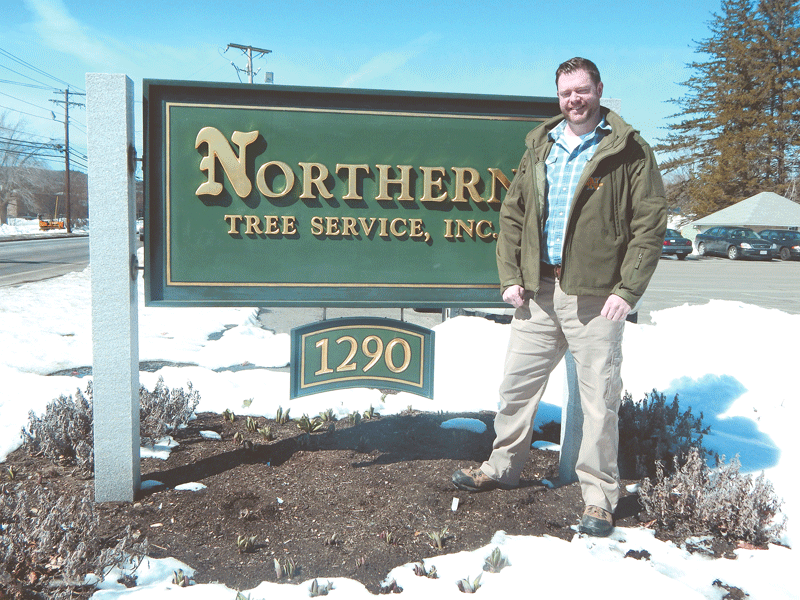 He soon recognized that processing and selling mulch was a huge business opportunity in itself, so he eventually transitioned out of the landscaping field to grow Mulch-n-More, also based in Wilbraham, full-time. “What I realized was, these customers I was supplying through Growing Concern, their neighbors wanted material — quality material — and that’s what ended up happening. Bark contains a natural insect repellent, which is one reason many homeowners prefer it to wood-pulp-based mulch, while others are just looking to save a few bucks with cheaper products. Despite these considerations, however, most customers come in most concerned about color. Wawrzyk enjoys educating them on the different aspects of each product beyond the shade. “Cedar has the highest percentage of insect repellent, and is fastest to fade, but slowest to decompose. Just like with cedar fence, clapboard siding, or shingles, cedar has the longevity,” he explained. The company also carries topsoil — a clay-based product that holds moisture well — and stone products for decorative landscaping, drainage, patio base material, and other uses. The landscape-supply business is an oddly paced one, said Wawrzyk as he brought BusinessWest to a large dirt lot where a loader was scooping huge piles of raw bark into a machine that grinds it into much finer pieces. The vast majority of all purchases are made between April and June, when homeowners are focused on their yards, and it’s impossible to know when the first flood of orders will pour in. “The weather has a lot to do with mulch,” he noted. “Most people are not going to put mulch down until they’re done cleaning out their yard. Some people, though, always order the second week of April, and that’s when they’ll be mulching, hell or high water. Mostly, it’s based on weather. So that’s tough for us; we have to be ready no matter what happens. And when Mother Nature says ‘go,’ we’re ready. Last year, for instance, the mulch season started much earlier than usual after a mild winter. Two years ago, however, the region was slammed with snow, and landscape-related businesses dealt with a later start. Customers are split almost 50-50 between landscapers and homeowners, he said, adding that orders from landscaping companies are easier because they bring their own trucks. Still, Mulch-n-More delivers mulch, priced by the cubic yard, to more than 30 towns throughout the region — often well over 50 deliveries a day during peak season. They also understand that the more mulch they use, the less mowing and lawn maintenance they need to do. 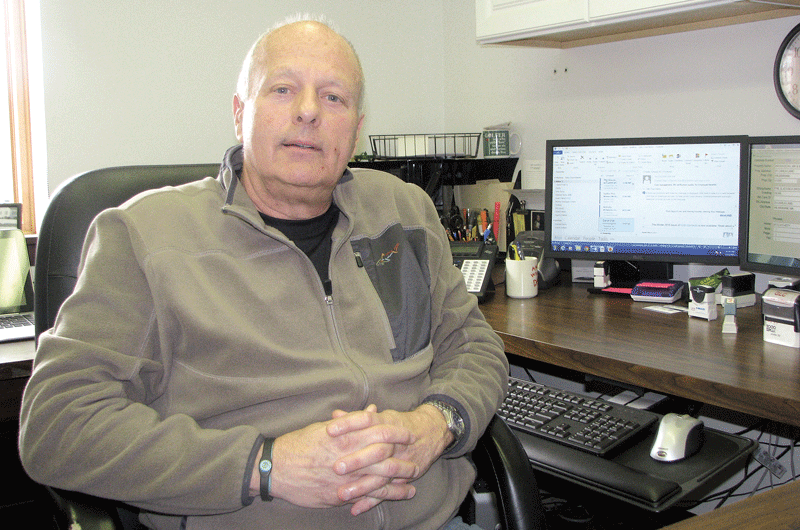 After 36 years in the landscaping field, Wawrzyk finds himself learning new things, especially the growing importance of social media in raising the company’s profile. But he’s also a believer in old-fashioned customer service. One of Amherst Landscape & Design Associates’ many hardscape projects. That’s not to say the last few years haven’t been positive. Since the lean times caused by the Great Recession, the landscape-design business, like other construction trades, has been on an upward arc. But something seems different — even more positive — this year, Roberts said. He admits the unseasonable winter — one in which the Pioneer Valley totaled well under two feet of snow and bare lawns, not mounds of snow, dotted the landscape throughout much of January and February — had something to do with that. Steve Prothers, president of Amherst Landscape & Design Associates, senses similar optimism in the air. Still, the mild winter and early onset of warm weather — give or take a couple late-season accumulations that melted quickly — gave landscapers about a four-week start on the time they usually start cranking up, which is typically mid-April. Roberts agreed that a strong flow of work among both commercial contractors and home builders over the past few years has definitely trickled down to landscapers. 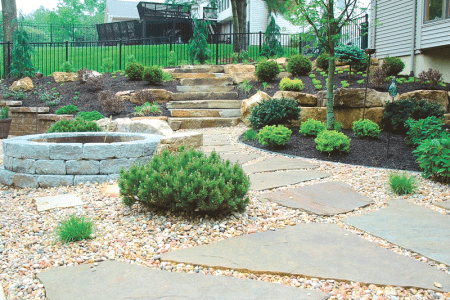 As a specialist in hardscaping, Prothers is in a good spot these days, as that aspect of landscape design has been on an upward track since the recession began to fade and people began reinvesting in their homes in earnest. 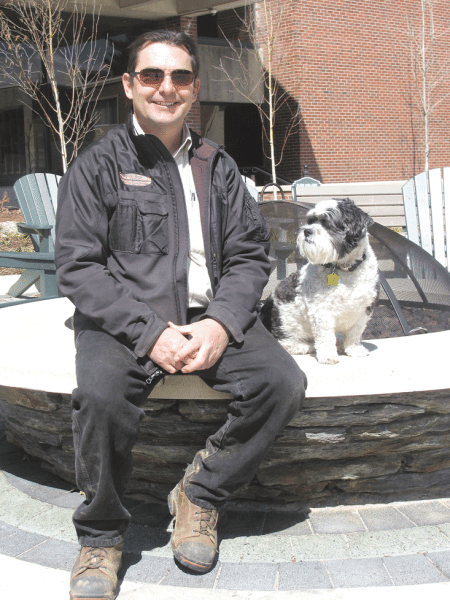 Steve Roberts and his dog, Max, enjoy a moment at the firepit on the Elms College quadrangle, which his company gave a significant makeover recently. They’re also increasingly looking to install artistic landscape lighting, also known as architectural lighting, a niche popular in the South that is coming into its own in the Northeast. As opposed to powerful floodlights, landscape lighting uses a variety of smaller accent lights to highlight the features of a home and yard. Other trends in this $6.3 billion industry, according to the organization’s 2016 survey, include heating elements, pavers, and environmental concerns, driving the popularity of solar-powered features, water conservation, and recycled materials. 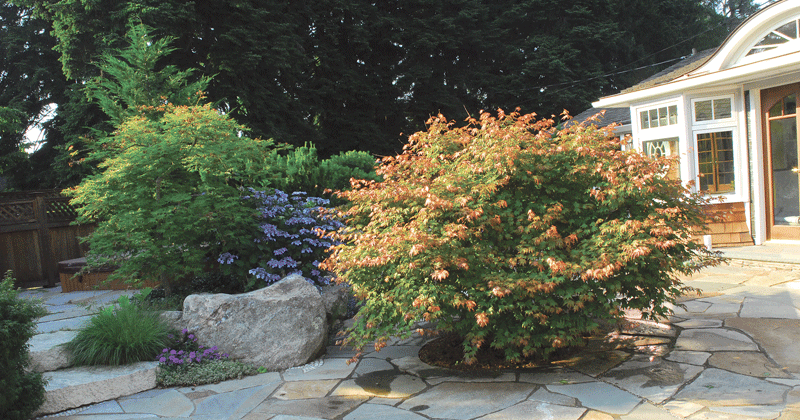 While the hot choices in landscaping features might vary from customer to customer, Prothers told BusinessWest, the professionals working in the field report similar levels of enthusiasm for what the spring and summer of 2016 will bring after that remarkably mild winter. The almost complete lack of snow this year, while a relief for the average Massachusetts homeowner weary of long, harsh winters, did pose some stress to landscapers — Roberts included — who turn to snow removal during the cold months. But he’s not complaining about the flip side. This landscape design by David Paine uses plants to create privacy as the steps behind this home lead to a hot tub. Bill St. Clair likes to compare the plantings around a home to a frame chosen for an expensive piece of artwork. It takes time and care to select the right frame — or, in this case, plants for a landscape design — but doing so is well worth the cost because it enhances the beauty and increases its value. Andy Grondalski agrees and says plants can also be used to create outdoor living space. 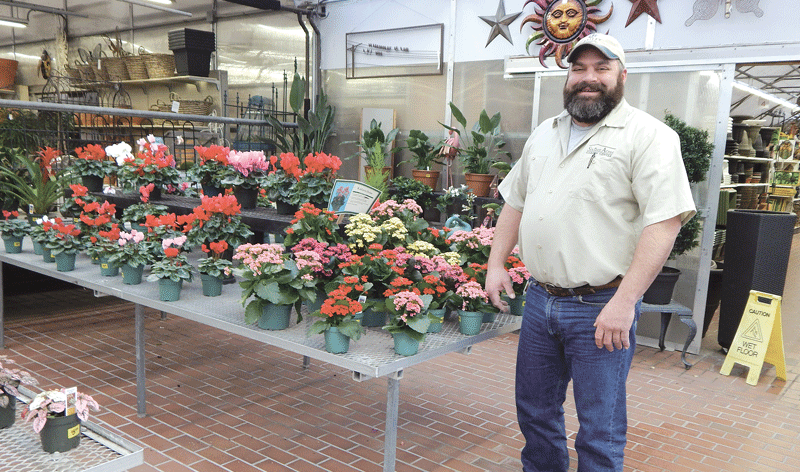 “Some people frame outdoor rooms with plants, while others use them on patios or along winding paths that lead to areas with a bench or pond or that open up into a field,” said the nursery manager from Sixteen Acres Garden Center in Springfield. “Annuals, perennials, shrubs, and trees can be used to define space and create a garden, and people can plant them with roses, hydrangeas, or different varieties of day lilies. “But it’s important to find the right plants for the right place,” he continued, adding that he has measured out 20-foot spots at the nursery and had people place plants alongside each other before they buy them to make sure they like how they look from a distance. “You may prefer something ornate, while other people want something simpler, but plants are an investment, so it’s important to be sure what you are getting is something you really like,” he noted. Andy Grondalski says people can have color in their yards year-round with the right mix of plants. Local experts say it’s also critical to use plants with a USDA Hardiness Zone 5 rating because they can withstand the harsh New England climate. The zones are based on average annual extreme minimum temperatures over a 30-year period, and although some people purchase plants rated for Zone 4 and Zone 6, they are less likely to survive when the weather turns cold. Although everyone wants plants that don’t require much maintenance, with the exception of mature trees and shrubs, they all need watering, and some require deadheading, pruning, trimming, repotting, and other work. “Plants are alive, and anything alive has to be cared for,” Grondolski said. For example, white oak trees produce acorns, while serviceberry trees, blueberry bushes, and various varieties of holly produce berries that birds eat. Paine said some people shy away from oaks because they views acorns as messy or worry they’ll dent their vehicles when they fall, but oak trees provide incredible habitats; more than 300 wildlife species are known to use or make their home in oaks, including dozens of types of birds. Flowering plants that attract bees and butterflies are also important and beneficial. “We would lose many of our food sources if we didn’t have bees to pollinate plants, and although some people are afraid of them, they are far more interested in the nectar on flowers than human beings,” Paine said. As the number of people concerned about the environment increases, those who love the look of a lush lawn are turning to varieties that are hardier and more drought-tolerant. “Everyone wants their place to look nice, but Kentucky bluegrass needs two inches of water a week, so it’s almost irresponsible to plant it,” Paine said, adding that replacing turf grass with ground cover is also a growing trend. Today, many landscapers use plants to define a space or create privacy around an outdoor living area. “We put Japanese painted ferns in 24-inch pots around a outdoor room in a Longmeadow home that has a fireplace and TV,” St. Clair told BusinessWest, adding that they are 18 to 24 inches in height and 36 inches wide. The use of ornamental grasses is also on the rise because they reach heights of five to seven feet and provide privacy and interest, as well as a soothing sound when the wind ruffles through them. The grasses need to be cut back six to 12 inches from the ground in the fall, although some people leave them standing until the spring because they like the way they look when they are covered with snow. They don’t begin growing again until late May or June, but can reach their mature height in two months. “They came into popularity over the past decade, are relatively easy to care for, and provide a different aesthetic,” Paine explained. People love colorful plantings, which can add beauty or create warmth in almost any area, and experts say color can be maintained year-round with a mixture of spring, summer, and fall perennials as well as bushes, including green or gold evergreens or holly, which are known for their glossy green leaves and bright red berries. He added that reblooming hydrangea is one of the most popular bushes, and it’s possible to change the color of the plant’s flowers from blue to pink or purple by changing the soil composition and making it more acidic or more alkaline. Filling large pots with plants can also add interest to a landscape, especially when they are placed on each side of the front door of a home or business. St. Clair has clients who like the look of these pots and have him change the flowers in them each season. Others prefer a more permanent plant and opt for dwarf Alberta spruce trees in pots, as they do well year-round and can be decorated with lights during the Christmas season. They reach a height of three to four feet and can be sprayed in the fall with anti-desiccant oil that prevents the moisture from escaping so they don’t dry out during the winter, although they do need to be watered until the pot freezes. The market for trees is also growing, and popular choices include varieties of Japanese maples with dome-shaped foliage that looks like an upright umbrella, Kousa dogwoods, Bradford pears, thundercloud plums, and apple trees. “People can have a small orchard in a 50-by-50-foot space if they plant dwarf varieties. They are the easiest trees to grow, and you don’t need a huge area or have to climb a ladder to harvest the fruit,” Paine said. Sixteen Acres Garden Center sold out of fruit trees last year, and Grondolski said people are still replacing trees that were downed during the tornado and freak October snowstorm several years ago. In addition to aesthetics, they are beneficial to the environment and reduce heating and cooling bills because they provide shade in summer and block the wind in the winter. Choosing a plant or tree can be daunting, however, as growers continue to offer an array of new varieties. Some, such as the Kousa dogwood, are disease-resistant, while hollies have been genetically engineered; until about five years ago, a holly plant would not produce red berries unless there were a male and female shrub within 100 feet of each other. “But today, growers have propagated a holly that has the male and female in the same plant,” St. Clair noted. Plants are an investment, and knowledge is required to make sure they not only survive, but thrive. Sixteen Acres Garden Center guarantees its plants for a year, and the majority that are returned have failed because of the way they were planted. “Many people make the mistake of putting soil too high around the stem, which causes rot and kills the plant. Or they place the plant too deep in the soil,” Grondolski said, adding that mulch around plants or trees should be tapered inward, and there shouldn’t be any about three fingers away from the base. “If you want to ring a tree with mulch, you should create a bowl near the base that catches water and can be filled with a hose,” he told BusinessWest. Paine said another mistake people make is not checking to find out how large something will grow. “A Colorado blue spruce is cute when it is young, but it will grow 70 feet tall and 35 feet wide,” he noted, adding that most plants eventually have to be moved or removed. However, many don’t require the trimming needed years ago when most homes had a row of yews planted in front of them. “Things in this profession keep evolving,” St. Clair said, explaining that, when he started out in business 40 years ago, most trimming was done with hand shears. That changed when gas hedge trimmers hit the market, but today, hand trimming has made a comeback. Another thing that has changed is the practice of planting yews in front of a home, which were occasionally punctuated by an azalea plant. Paine said the idea of putting shrubs in front of a home originated in Victorian times because the multi-storied homes with steep staircases that were being built at the time didn’t look like they were anchored to the ground. Today, landscapers tend to put accent plants in key locations such as the corners of a home, on either side of the front door, or along the front walkway. The amount of space people have to work with makes a decided difference, and Grondolski said people who have only eight to 10 feet in front of their home often choose to tier plants of different heights to add interest. St. Clair said many people with demanding jobs don’t want to spend time caring for the plants on their property. As a result, a growing number of clients have him maintain their plantings, and if they do their own maintenance, they make sure someone waters their plants when they are away during the summer. “Protecting their investment is very important,” he said. And, indeed, the reasons surpass aesthetics and money spent on them. “Many people find plants and gardens therapeutic, whether they are sitting on a bench and admiring them or down on their hands and knees working,” Grondolski said. So, with longer days and warmer weather on the horizon, it’s an ideal time to look online and make careful choices about plants that can be used to frame a property, enhance it, and increase its value. When some people think of outdoor lighting, they may think of floodlights and porchlights — but many more options are available in the emerging world of architectural lighting, which accents the details of front and backyards, melding safety and security with atmosphere and aesthetics. Designing and installing these systems is both art and science, say experts in the field, who are always gratified by the ‘wow’ factor when homeowners flip the switch. After 23 years as a graphic designer in the sign-making industry, Rob Larkham decided to design and install landscape lighting for a career — a job that requires long hours of manual outdoor labor. Larkham is actually the second owner of Illumascape. Phil Costello, who founded the business, was one of Larkham’s customers, and when he was nearing retirement, he approached the graphic designer, believing he would be a good choice to take over the landscape-lighting company. So Larkham came on board four years ago and took over the reins a couple years after that. Landscape lighting, also known as architectural lighting, has long been popular in warmer climes, but in the Northeast, most homeowners have been satisfied with porchlights and maybe a floodlight out back. But, increasingly, they’re seeing the aesthetic value in the variety of techniques available from companies like Illumascape and numerous landscape-design firms. As Larkham explained, landscape lighting is the permanent placement of lighting fixtures in the outdoor environment, with the aim of highlighting the form, texture and definition of landscape plantings as well as enhancing the architectural features of the home. In contrast to one or two floodlights, architectural lighting may utilize dozens of smaller, strategically placed fixtures to accent the details of a home and yard. Rob Larkham says customers choose architectural lighting for both aesthetic and security reasons. Gary Courchesne, owner of G&H Landscaping in Holyoke, said the emergence of energy-efficient LED diodes has made landscape lighting more popular, because people see the long-term value in what, admittedly, can be a hefty up-front investment. He and Larkham both noted how the fixtures are designed to direct each beam in a specific direction, with techniques ranging from uplighting and downlighting to path lighting and ground lighting. The key to successful lighting, Courchesne said, is professional design. He noted that a flood of low-voltage lighting kits hit retail stores over the past decade, and many people bought them, were unsatisfied, and didn’t think about it again. That’s because they didn’t have a skilled designer and installer on their side. With homeowners in the Northeast investing more money in their properties in recent years, he went on, many are now becoming aware of professional landscape-lighting design, which is ubiquitous down South. Larkham said customers run the gamut from contractors building a new house and including landscape lighting in the initial design to homeowners who have been in their homes 25 years or more and have an itch to do something new and dramatic with their outdoor space. This Illumascape project demonstrates how small, strategically placed lights bring out the details of a house and yard. For example, the same kind of tree could be lit using completely different techniques, depending on the yard. In many cases, he added, a customer’s neighbors may have architectural lighting, but when someone sees it on their own property, it’s a much more impactful experience. He told BusinessWest that the results are gratifying. As landscape lighting becomes more prominent in the Northeast, customers are accessing some high-tech features not previously available. Residential Lighting magazine noted that, while low-voltage LED lighting is the key industry driver these days, linking lighting systems to smartphone apps, to control them remotely, is also a hot trend. Gary Courchesne says the goal of any landscape-lighting project is subdued, artistic light. Courchesne also stressed the importance of subtlety in a lighting plan. He said today’s LEDs can bathe their target with a soft, warm, white glow, as opposed to the harsh blue light with which some people associate earlier LEDs. Larkham added that, as time goes on and LEDs become more universal, costs should come down, and are already starting to creep in that direction, which is a good sign for homeowners who want to add a little artistry to their landscapes. “It’s becoming more popular, it seems the technology is advancing every year, there are always new things happening,” he concluded. 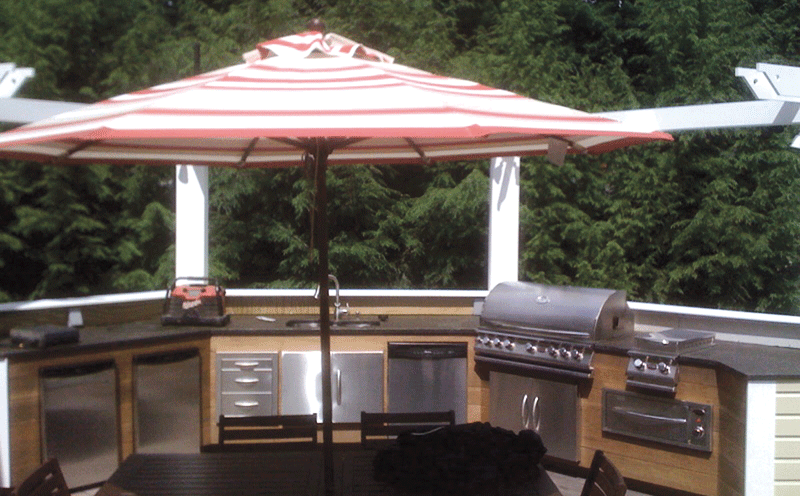 Brian Campedelli says built-in kitchen appliances like these are often just the starting point for a backyard project. For American families on the go, Brian Campedelli says, home should be an oasis from workplace stress and the general bustle of life. “I think they’re looking for a general sense of relaxation in their yard. When they get home from work, they tend to be stressed out, and they want to kick their shoes off, throw on some flip-flops, head to their backyard resort, and forget about things for a while,” said the owner of Pioneer Landscapes in Easthampton, explaining why outdoor kitchens and living spaces are becoming more popular, and elaborate, in the Northeast. Outdoor kitchens — which can include anything from a simple built-in grill to expansive cooking surfaces, refrigeration, plumbing, audio-visual hookups, and more — are at or near the top of most lists of hot landscaping trends, along with firepits, water features, and architectural lighting, even in a region where people don’t want to spend much time outside for several months a year, the current mild winter notwithstanding. He, like others BusinessWest spoke with, agreed the Northeast has lagged somewhat behind other regions of the country, particularly warmer climes, in expansive outdoor living spaces, he added, but that’s changing. Jason Harrington says homeowners are increasingly seeking a resort-type feel in their backyards. According to the Hearth, Patio & Barbecue Assoc., patios are consistently among the top three features requested by new home buyers, and most aren’t leaving them bare, opting for permanent cooking fixtures, refrigerators, and other amenities. Meanwhile, noted Rick Miller, owner of RJM Landscaping in Southampton, existing homeowners are increasingly itching to bring the indoors outside. 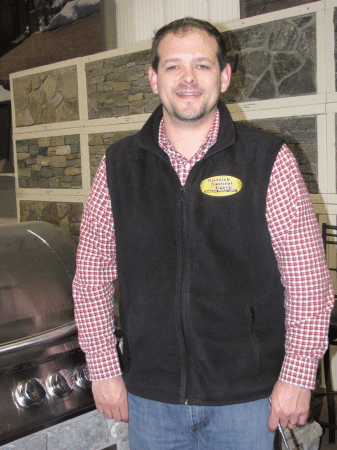 Justin Pelis, president of North Country Landscapes & Garden Center in Westhampton, said outdoor kitchens can run into serious costs on appliances alone, since they’re typically built into the stonework. Those who opt for the higher-end designs tend to be committed to outdoor entertaining to justify the cost, Miller added. Harrington said homeowners on a budget shouldn’t be scared off by the sheer range of amenities available for outdoor cooking and living spaces. Miller has tracked the same statistics known across his industry, how Americans, over the past 15 to 20 years, have increasingly chosen to forgo travel and invest in their homes and yards. This Pioneer Landscapes project features a fireplace as the centerpiece. And it’s not just for the adults, he added. The bottom line, Pelis said, is that homeowners are increasingly seeing not only the potential aesthetic value of their yards, but the functionality, and kitchens and other outdoor-living features are a big part of that. 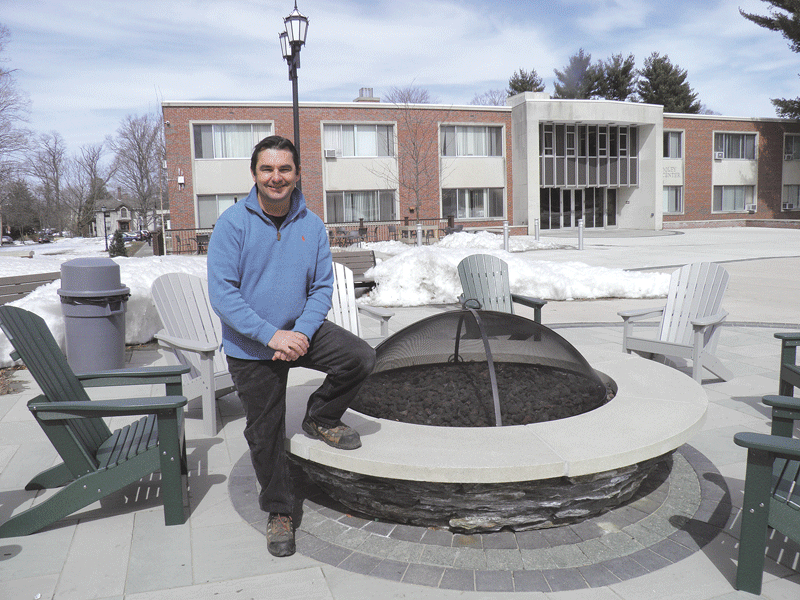 Stephen Roberts shows off a gas firepit that Elms College recently installed in a courtyard. Last summer, a successful businessman asked Stephen Roberts to construct an edible forest on several acres of his backyard property. “He said he wanted to go home after work and have a place where he could ‘devolve.’ He grew up on a farm and loves gardening and the outdoors,” said the owner of Stephen A. Roberts Landscape Architecture and Construction in Springfield. The design Roberts created includes fruit trees, a trail, and a woodland area with plants that range from elderberry and pawpaw to wild ginger and wintergreen, that can be picked throughout the growing season. Although the request was unusual and most people aren’t looking to create their own forest, local landscapers say a growing number of clients are spending money on backyard retreats that provide them with a place to entertain and enjoy the outdoors. Justin Pelis says people want the experience of growing fruits, vegetables, and herbs in their backyards with their families. He added that an increasing number of young families want to grow vegetables and fruits with their children, watch birds and feed them, and cook outdoors in spacious kitchens boasting built-in, stainless-steel appliances. He noted that participants are taken on a tour of the nearby Blackbird Vineyard, where all of their questions are answered. Steve Prothers, who owns Amherst Landscape & Design Associates and has designed more than 3,000 commercial and residential landscapes, agrees that people want their backyards to be as pleasing, attractive, and fruitful as possible. Natural landscapes are in style, and he said swimming-pool areas are being updated by replacing concrete with natural stone or Travertine tiles, which come in white, tan, cream, and rust-colored varieties. “They give the area an Old World look,” Prothers said, adding that his company specializes in hardscapes that includes patios, retaining walls, walkways, and pool surrounds. Many clients ask for a pergola, because its mini-roof gives an outdoor space the definition of a room. “It’s a very decorative feature that frames in an area and creates an intimate space. But a pergola can also be functional because it can provide shade,” he said, noting that roof rafters can be placed close together to block the sun, or the structure can be planted with scented vines, such as wisteria or bougainvillea, that give it a tropical feel. Pelis has built pavilions with roofs over patios that people use as sitting areas. “They put TVs in them, and the patio can extend beyond the sitting area,” he said. 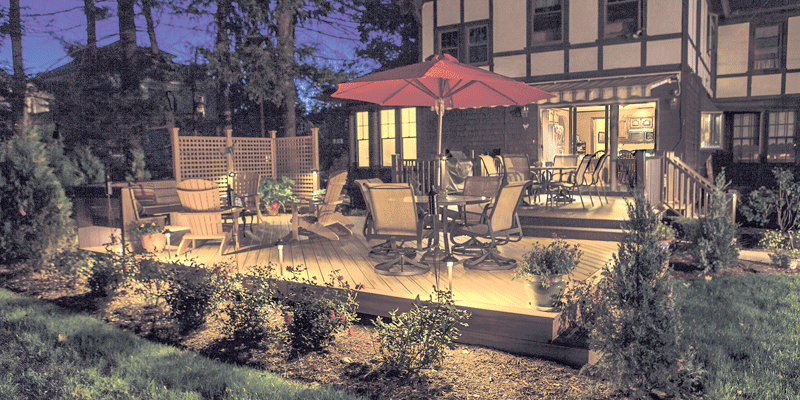 In fact, patios are becoming more popular than decks because they require less maintenance. “Patios give people more flexibility to expand and can be built with pavers, which come in a wide variety of contemporary styles. Some look like wood, others look like granite, and some are very modular,” Pelis said. Since landscaping is an ongoing process, many people have their yards done in phases and add a new area each year. However, the work often begins with creating new entryways to the house. Nic Brown and Steve Corrigan say many towns and cities are adding spray parks for children and adults to enjoy. The desire to create a backyard oasis gained momentum in 2008 when the economy tanked and so-called ‘staycations’ became a household word. But local landscapers say many people held off on projects due to uncertainty over jobs, and pent-up desires are more apt to be realized this summer than they were in the past. “The recession impacted landscaping projects, but now that the economy is improving, I think we will get more requests,” Roberts said. Coveted plans typically include backyard areas designated for specific activities. “It’s not unusual for a family to want a cooking area with a built-in grill, a place to sit and eat, a firepit, and another space with an outdoor couch and a coffee table,” Roberts said. Stephen Corrigan agrees. “More and more people are spending money to create outdoor kitchens and living areas with TVs in a protected area,” said the owner of Mountain View Landscapes and Lawncare in Chicopee. 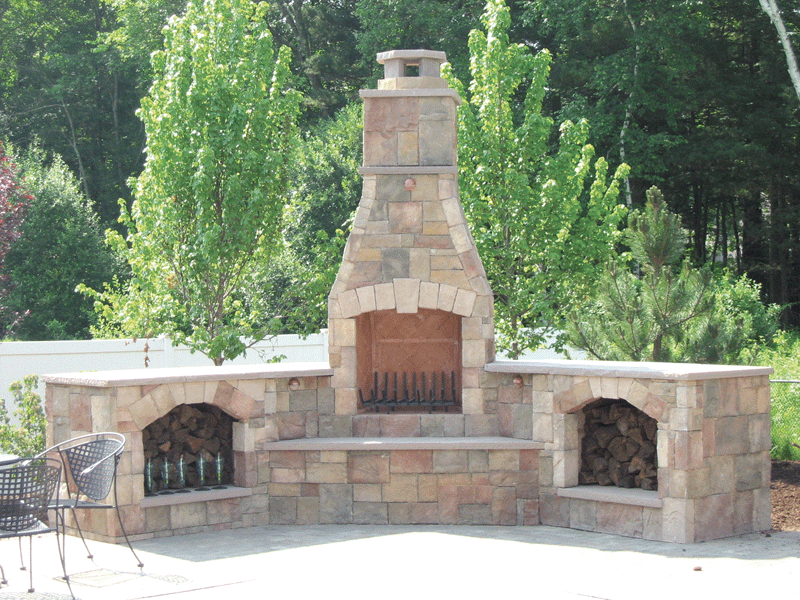 Another advantage of a firepit is that it can create a focal point in an outdoor living room. “People put furniture around it in the same way they would put it near a fireplace inside their house,” Prothers said. 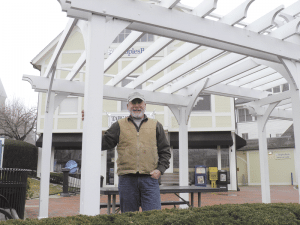 Steve Prothers says many homeowners and businesses use pergolas to create an outdoor room, which can be aromatic if covered with flowering vines. Water features are also in demand, but instead of swimming pools, most people are choosing simple but soothing options such as waterfalls. “They are beautiful and attract birds, but don’t require much maintenance,” Roberts said. One client with a back problem installed a hot tub surrounded by beautiful plants with a waterfall a short distance away that could be lit up at night. “He could sit in the hot tub in the evening, enjoy the sight and sound of the waterfall, and get relief from his pain,” he noted. Roberts added that small ponds or plunge pools are still popular. “But people don’t want to use chemicals in them. They want biological filters,” he said, explaining that the ponds he installs are typically four to five feet deep with ledges that people can sit on. Pelis said his clients are getting away from ponds, but do want water features that look natural, and often choose a fountain or pondless waterfall that pours into a rock filtration system. “They want the sound and sight of water without having to do a lot of maintenance,” he explained, adding that another option is to have water flow from the undersides of raised patio walls into a decorative bed of stone, which filters it into a concealed basin, where it is recycled. Plantings play an important role in landscape design, and Prothers said ground covers and plants that provide seasonal interest throughout the year are in fashion. Pelis added that native plants such as milkweed, which attracts Monarch butterflies, along with wildflowers and species that attract bees, have become popular as people seek to create natural environments. Local landscapers expect the season to begin late this year due to the volume of snow. “Spring is in the air, but people have just started to come out of hibernation,” Roberts said. Corrigan agreed. Although his company is often working by mid-March, this year, the timeline will be pushed out until mid-April. Most of his business is commercial, and trends are also emerging in that arena, with water conservation and stormwater runoff among the ingredients that weigh heavily in public projects today. “Permeable pavers are an attractive, green solution that take the place of concrete and asphalt; they allow as much water as possible to be kept on the site,” said Project Manager Nic Brown. In some cases, it is funneled into rain gardens, said Corrigan, adding that Mountain View has built parking lots with rain gardens at the perimeter where very porous soil absorbs and holds water before any overflow goes into the sewer system. He cited the Massachusetts Green High Performance Computing Center in Holyoke and a new science building at UMass Amherst as examples of structures where water drainage has been curtailed, and said some systems are designed so rainwater and melting snow from the roof are channeled into a filtration system of tanks that feed rain gardens. 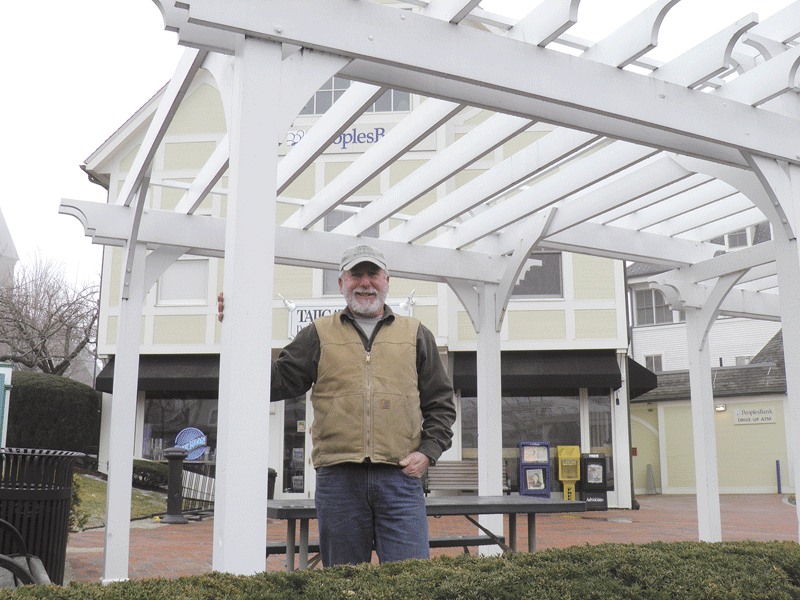 His company recently won a regional award for its work on the town square in Mansfield, Conn., in conjunction with the architect who designed it. The area is the focal point of a newly created neighborhood that contains four five-story podium buildings with 414 rental units and 101,553 square feet of commercial and retail offerings at street level adjacent to the University of Connecticut. Another growing trend is spray parks, and new ones will be built this year in Agawam, Springfield, Greenfield, and Northampton. “Cities and towns are replacing swimming pools and wading pools with spray parks; they have become more and more popular in the last three to five years,” Corrigan said, adding that they provide safe, cost-effective areas where people can congregate and relax during the hot summer months. The spray features can be programmed to go off during times set by the town, city, or organization that builds them. When someone presses the mechanism that activates the system during the specified time, the features begin to spray water in a preset sequence, and children quickly learn to run from one station to another. The desire to spend time outdoors in public and private spaces continues to grow, and whether someone is planning a commercial or residential project, environmental concerns are taking an expanded role in today’s landscaping projects. Roberts said his customers are requesting blueberry bushes, strawberries, and herbs as well as small plots where they can grow vegetables. Other landscapers report similar requests and agree that enjoying a backyard involves far more today than it did a decade ago. Andrew Crane says some clients are more environmentally sensitive than others, but they typically appreciate the long-term cost benefits of sustainability. Andrew Crane says homeowners love the idea of energy efficiency and green construction — it’s the price tag they don’t always like. It’s true that, in most cases, switching from traditional to energy-efficient products will save money over time, the initial cost can be an obstacle to homeowners remodeling on a budget. 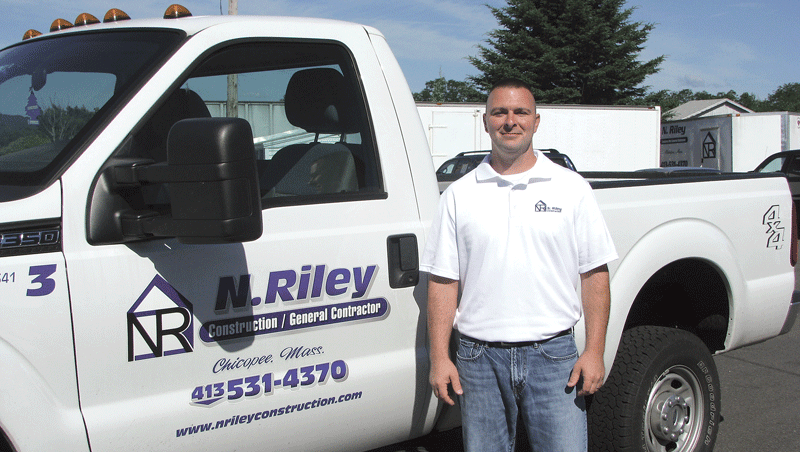 Nick Riley, president of N. Riley Construction in Chicopee, agreed, but added that some energy-efficient home improvements are already becoming standard, including Energy Star-rated appliances and insulating window glass. “As you get more in depth into remodeling, as far as ripping down walls and reinsulating, people are concerned about it and ask about ways in which they can do it — but cost sometimes can be a pretty big factor in whether they decide to do it or not,” Riley explained. Still, sustainable building is on the rise. The National Assoc. of Home Builders (NAHB) recently surveyed members about the features they’re most likely to include in new homes this year, and the top 10 included Energy Star-rated appliances and windows and programmable thermostats. Meanwhile, the organization reports an overall uptick in construction that incorporates energy, water, and resource efficiency; improved indoor environmental quality; and sustainable and locally sourced products. John Majercak understands sustainable building and remodeling. 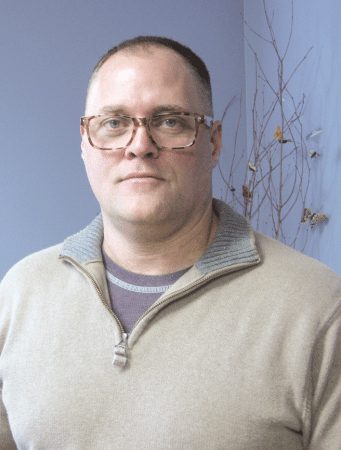 As president of the Pittsfield-based Center for EcoTechnology (CET), he helps clients — who include both contractors and homeowners — go green in their projects. Another resource is CET’s EcoBuilding Bargains store in Springfield, which sells reclaimed building materials. Nick Riley says today’s contractors feel a responsibility to explain sustainable options to customers. Another resource, he noted, is the Mass Save program, which provides energy audits for homeowners and introduces them to incentives and rebates available for certain sustainable upgrades, from boilers and appliances to insulation and windows. The NAHB survey revealed that nearly 25% of home builders have installed alternative-energy-producing equipment in new construction, including geothermal heat pumps and photovoltaic solar panels. The current 30% tax credit available for homeowners who install this equipment is set to expire at the end of 2016, which makes this a good time for interested buyers to consider purchases. Millennial buying trends suggest that sustainable building options should outlast any expiring rebates. Another NAHB survey revealed that Energy Star certifications are a priority for these young home buyers, and 84% of this group is willing to pay 2% to 3% more for an energy-efficient home as long as they can see a return on their power bills. One example is spray-foam insulation (see related story, page 23). 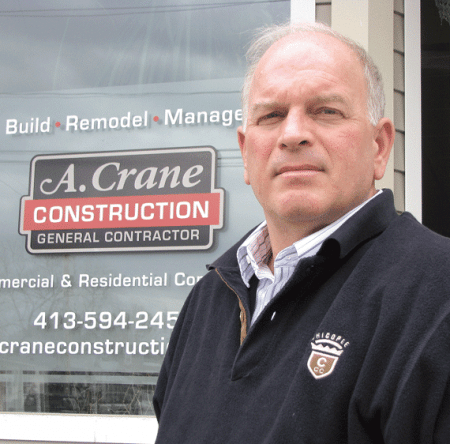 “Generally, it’s twice as expensive if not more,” said Crane, whose company uses the product in 90% of its residential projects. There’s no doubt in Majercak’s mind that sustainable building and remodeling is poised for continued growth, if only because building codes are increasingly reflecting green priorities. At the same time, Majercak said, more homeowners today are doing their own research and recognizing the value of sustainable choices. Reflecting that public mood, Riley said, builders today feel a greater responsibility to inform customers of ways they can make their homes more green and energy-efficient. Meanwhile, even homeowners who aren’t remodeling can take steps to cut into their utility bills, Crane said. At a time, it seems, when homeowners increasingly want to do the same.